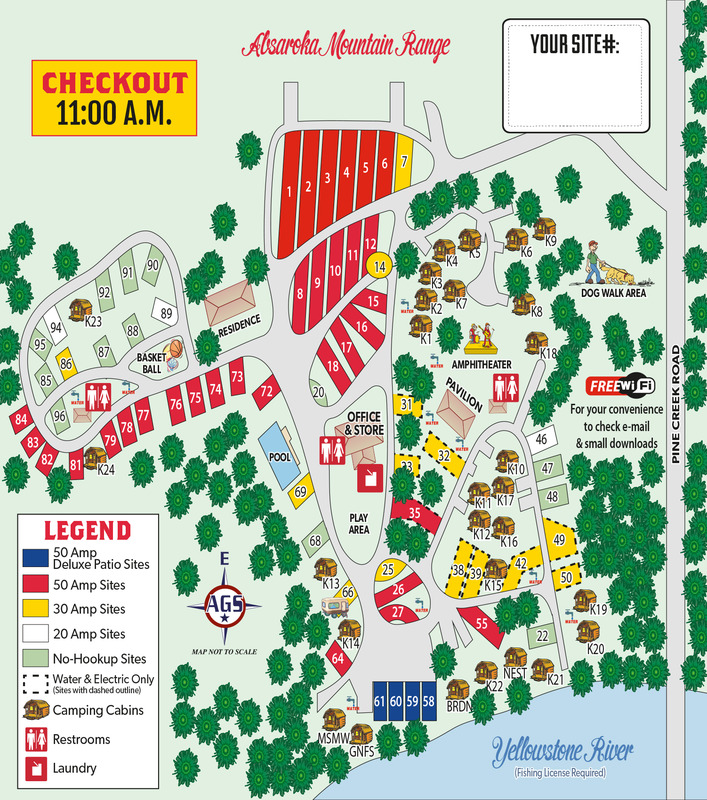 Ask fellow campers about "Livingston / Paradise Valley KOA" and nearby attractions. Mosquitos! We had the best spot in the park as far as a view but the mosquitos were terrible - you had to spray morning, noon, and night. In fact we only had a fire one cold night to avoid getting bit. They did weed whack down by the river and that maybe kept them down but all in all terrible. Bought a thermacell at the the local hardware store to supplement our spray. Typical KOA campground with kids and crowds but the location was great. Our spot was nice with the stone paver patio and fire pit. We did have a hole that I requested to be filled and a barrel with no flowers that was subpar and those items never got taken care of. The cost of the site was high in my opinion. Not able to kayak the Yellowstone as it was running fast and hard although it improved towards the end of the visit but it was still too fast for us Floridians. We camped at Livingston / Paradise Valley KOA in a Motorhome. Attended the Livingston Scratch Rodeo and the parade the day after - FUN! Farmers market on Wednesday evening had great BBQ and Soba noodles. Yellowstone was an all day affair but amazing. We did the Lamar Valley route and saw bears, coyotes, and buffalo up close and personal. Great fly shops that steered up to fishable creeks in the area. Cutthroat heaven! This is a very beautiful park, close to the river, with many, large mature trees. The staff were very friendly and helpful. It was Father's Day, so the park provided a food truck with excellent BBQ menu items. The store is well-stocked with RV items. The camping fee was a bit more than what we usually pay, but its proximity to Yellowstone makes it worth the extra money. We would return to this park. 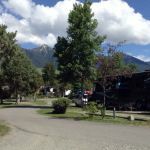 We camped at Livingston / Paradise Valley KOA in a Travel Trailer. If you're going to Yellowstone, leave early. There are very long lineups at the gate after 11:00 a.m. and there is much more wildlife to be seen early in the morning. Nice campground by the river in a wooded area. We have stayed here many times. The indoor pool is great, and there was a food truck at the campground one night. 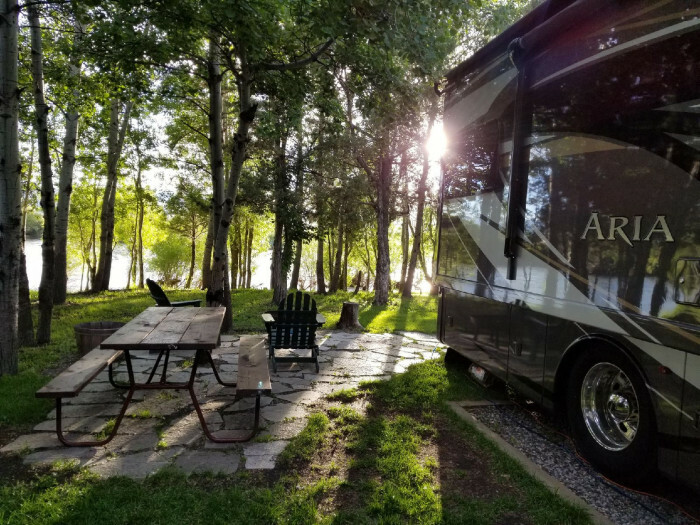 We camped at Livingston / Paradise Valley KOA in a Fifth Wheel. We stayed here in a 35 ft 5th wheel. The roads were REALLY tight. In order to get into our site, we had to climb a little hill and make a tight turn. Once on top of the little hill, our site was nice and level! The bathroom floors were always muddy. The best thing about this place is the staff and the Yellowstone River! A member of the staff gave us information on where to launch our kayaks and offered to shuttle us back to our truck! That was sooo nice! We camped at Livingston / Paradise Valley KOA in a Fifth Wheel. Make sure you spend time on the Yellowstone River...fishing, kayaking or rafting! It's right outside your door! Off beaten path, but a nice location. Pull-thru site too tight to open all 4 slides. Awnings had to stay in also. Watch out for the water hook ups. Possible to hit when opening your slides. Complained about the site and told we could stay or go. Gravel interior roads a little tight. Will not stay here again. We camped at Livingston / Paradise Valley KOA in a Motorhome. Our site was right on the Yellowstone river. Staff friendly. Bathrooms the best I have been in. Very clean. We camped at Livingston / Paradise Valley KOA in a Motorhome. An older KOA. Sites are narrow and short, minimal space for tow vehicle. Before parking - survey and plan accordingly :) Swimming pool is "indoor" and well maintained. Our granddaughters really enjoyed it. Park is "off the beaten path" so there is no traffic noise, only normal daytime park sounds. Campground is popular as there were very few nights when there was an open site. We had a three week stay. We camped at Livingston / Paradise Valley KOA in a Fifth Wheel. 50 miles north of Gardiner MT/north Yellowstone entrance. 20 miles from Bozeman MT. 10 miles to Livingston MT. Livingston has grocery, hardware stores, pharmacy's, all fuel types, propane available, fast food and nice dining establishments. River rafting tours and fishing are many of the recreational options. We had a pull-through site that was so close to the adjacent site we only had about 5 feet between slides. The sewer hookups are located next to the "patio" near the center edge so you have to step over and around it if you are using the picnic table. Not very appetizing or sanitary. We were charged an early arrival fee because, and I quote, "it was an inconvenience for us to be there for the grounds crew". We arrived at 11:30, check in is late, at 2:00. The pull-through sites were mostly weeds. The site was in desperate need of maintenance. There was continued gunfire from around 3:00 PM to around 8:00 PM. Not sure if it was someone in the park or someone right on the border. 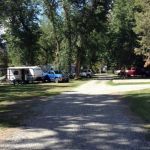 Most RVs were alarmed and we all stayed inside hoping a stay bullet did not hit one of us. I did not see any attempt from staff to remedy this issue and I have no idea if this is a common problem. We did not feel safe at this KOA. We camped at Livingston / Paradise Valley KOA in a Travel Trailer. This park is at least 10 miles from Livingston and about 40 miles to Yellowstone NP entrance. Stayed one night; would have stayed more if we were visiting Yellowstone. Staff was very nice and property was beautiful. Some of the sites were snug with not a lot of privacy, but we were able to fit our truck and 40' fifth wheel (opposing slides) just fine. Nice indoor pool and playground, which the kids loved. Paid $56 with tax (with KOA discount) fir a 50amp full hook-up which is pricey. Property was quiet. All-in-all, a very nice stay. We camped at Livingston / Paradise Valley KOA in a Fifth Wheel. Do not arrive before check-in as up until 12noon, other RVs will be leaving the one lane entry road. Tight spots but still had enough privacy. On the river with cabins as well as tent and RV sites. Very kid friendly which almost was a detriment as racing bikes were a little dangerous on tight roads. Laundry was super nice! Would stay again. Reservations a must as full when we were there. We camped at Livingston / Paradise Valley KOA in a Motorhome. We loved this place! It is off the main road next to a rushing river. Although it was slightly cramped, we still felt we got a lot of privacy. The cabins on the river are really nice (we stayed in an RV site). Could hear the cows mooing in the pasture next door. Very pleasant and quiet. Highly recommended! We camped at Livingston / Paradise Valley KOA in a Motorhome. At north end of Yellowstone National Park. Easy access but keep in mind that Yellowstone is huge, so I'd plan on staying in the middle of the park to your that section (Yellowstone Canyon and Geyser area); otherwise, you're in for a long drive. Campground is well off highway so no traffic noise. 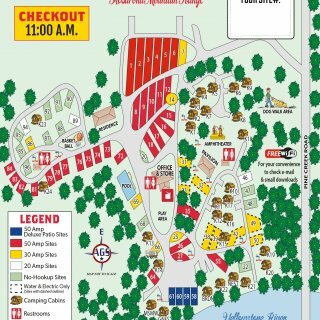 Our visit was during 100 year celebration of National Park so campground was full. Very large facility, well laid out. We camped at Livingston / Paradise Valley KOA in a Fifth Wheel. Campground is 50 miles north of Gardiner/Yellowstone and sightseeing op. Ten miles south of Livingston MT and grocery stores, gas and propane, and dining experiences. I've reviewed this park before and we just stayed 3 nights again. This is a very nice Park, big sites, lots of shade, good power and water, friendly staff. The had an ice cream social last night. Yummy ice cream, $2 a scoop. Very kid friendly pool and play ground, bikes for rent. The deluxe back in sites along the river are lovely. My only 2 criticisms are slow WiFi and not much for sale in the store for groceries, beer and wine. Best to get that stuff in Livingston as this park is 10 miles south of town. We will return here again. We camped at Livingston / Paradise Valley KOA in a Fifth Wheel. This is a wonderful park. It is about 1 hour from the northern gates into Yellowstone NP at Gardiner. The park staff are friendly and the grounds are kept clean. We had the best breakfast we have ever had at any KOA! They have an off-leash dog area near the front entrance to the park. The pool is an indoor/heated pool. WiFi worked well for our stay. They have an ice cream social ($$) every evening. The park is about 1 mile off the highway so it's nice & quiet at night. We would definitely stay here again. 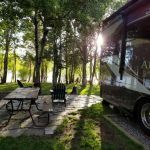 We camped at Livingston / Paradise Valley KOA in a Fifth Wheel. Almost level sites. Nice paved patio with table & chairs. Didn't use indoor pool, but looked nice & many campers were enjoying it. Sites are pretty close together, so that nice patio area is about 1 foot from your neighbors sewer hookup. The showers could be a bit better (nicer shower head, some sort of shelf for shampoo & such would be nice). Shower water pressure was almost too good! The location is wonderful: lovely mountain views, well off the highway, & nearby Pine Creek Trail is a great hike. We camped at Livingston / Paradise Valley KOA in a Fifth Wheel. We took the hour trip to Yellowstone. There is another campgroud closer that looked very nice though. Buy what you need before you get there because town is 15 miles away. Bring lots of bug spray and citronella candles. Costco, Walmart, Loews, etc is forty minutes away in Bozeman. 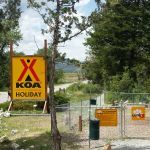 Are you affiliated with Livingston / Paradise Valley KOA ?